It’s frustrating to call your pet and get no response. Do you know how to train a dog in recall? Here are two exercises that add fun into the training. How to train a dog in recall? It can be frustrating to call your pet and get no response. 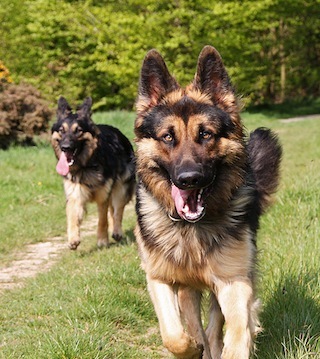 Do you know how to train a dog in recall? The traditional way of training a dog in recall, through luring, doesn’t always lead to a reliable recall 100% of the time. An unreliable recall can lead to disasters, and if the “come” cue isn’t maintained, you could be in for some trouble. Whether you are just starting to train a dog in recall or are practicing an already known cue, playing ping-pong with your dog can be a fun way for your dog to learn. This game adds speed and excitement to the recall. The more fun your dog is having while coming to you, the more interested he will be in responding to you when you call in the future. To set up the ping-pong game, go to an area with no distractions and have two people stand about 10 feet from each other. Each person should have a good amount of desirable hidden treats. One person at a time holds a treat out at about nose level for the dog and says, “Come!” Make sure the command is said in a very excited voice. When the dog comes, praise heavily and offer the reward. The dog will be running back and forth between the two people. He should quickly learn the game, and when he starts to predict that the other person will call him, switch it up! You should call the dog twice when he wanders to the other to get the treat before called. He will not only be learning “come” in a fun way, but he’ll be getting some exercise too. Playing hide-and-seek with your dog will teach him that even when you aren’t visually present, he still should respond to the recall and will get rewarded for complying. This game is better played when the dog is familiar with the “come” command and has responded to it when distractions are present. It can be played inside or outside, but I prefer to play it outside where the dog can get more accustomed to distractions. Watch his progress in a way that does not give away your hiding spot. If the dog knows the command and has been rewarded for it in the past, he will start sniffing and searching for you frantically. If he gets confused and cannot find you, say the dog’s name again, not the command. When the dog does find you, praise lavishly and wait him to sit before offering the reward. You don’t want to reward him for doing things like jumping or barking, which he will probably do when he finds you. When playing ping-pong or hide-and-seek, make sure you increase the distance between you and the dog as he improves. If at any time when you are training the dog in recall, he doesn’t respond or doesn’t seem to be improving, there are a couple of things you can try to help set your pet up to succeed. If he seems very distracted by his environment, reduce the distractions. Begin practicing the recall in a “boring” room in the house. Distractions should always be slowly introduced when starting a new command or cue. You also may be using the wrong reward. If he doesn’t seem too interested in the Cheerios, try some hot dog pieces, cheese or soft dog treats. Dogs will respond much better to training when they have an incentive to behave. When you know exactly how to train a dog in recall, you’ll discover that dogs respond much faster and more eagerly if they have learned to come in a fun manner, have an incentive and are not distracted by their surroundings.